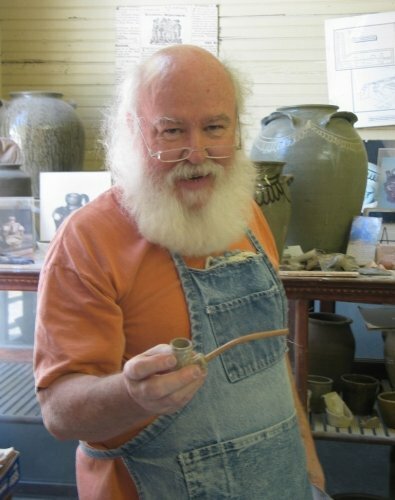 Artist Stephen Ferrell holds a clay pipe made from an original mold dating back to the 1800s. The pipe’s bowl was made by pressing clay into the mold, then reaming out the bowl and stem. The product was then fired in the kiln and fitted with a cane stem. Finally, it was sold by local merchants for just a penny. I’ve been told that if anyone can help me with Edgefield pottery, and especially pottery by Dave the Slave that I should start with you. I acquired an alkaline glazed marble about 8 months ago from a gentleman in Columbus, Ohio that I got to know through church. He got the marble from doing digs in Edgefield. At the time, from 1982 to 1999, he lived in Georgia and spent his vacations going digging, mostly in the Edgefield area but also in North Carolina & Virginia. He said he went digging from 1982 to 1999 and believes he dug the alkaline marble that he believed may have been from Dave the Slave between 1982 to 1986. I also acquired several other marbles from him that I believe he said he dug in Edgefield also, but, they don’t have the alkaline glaze. Of course, the alkaline glazed marble isn’t signed but might there be any way you could be of help to help verify if the marble is from Dave the Slave, please? I can put you in contact with the person I bought the marble from if that would be of help. I’d also be more than happy to ship the marble(s) to you if that would be of help. Any advice/information would be appreciated, greatly. Thank you, very much, and I hope you & yours have a beautiful & blessed 2019. Sounds like a Dave piece! Consider yourself very fortunate ~ worth a fortune! My husband and I were in an old church bargain store hunting for treasures when he came across 2 items of old pottery – a casserole dish and some sort of tea pitcher or coffee pot. We knew it was very old and looked like a confederate grey color. When we got home I looked them over and found a name – Dave. Someones college art project it seemed, but I told my husband to look it up you never know. We did and are wondering if it could be this Dave the potter? Any help would be great! Thanks so much and have a blessed day! Hi Emelia! Thanks for your support and for taking the time to leave such a nice comment! I love this picture and this site. I hope that it stays on the internet forever and I hope that no one ever says anything mean to you. I love y’all!